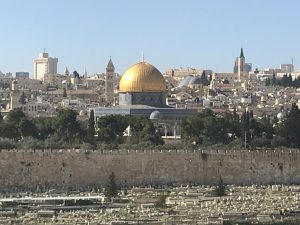 So much has been written about Jerusalem, so my describing the sites is meaningless. All I can offer here are my observations informed by the knowledge of my guide, Berhanu, an Ethiopian Christian and a close friend of my second cousins, who has studied and lived in Jerusalem since childhood, but is not responsible for my reactions. I am staying on a narrow lane not too far from Hapalmach Street, formerly a wealthy Arab suburb although the Arab residents left in 1967; the residents are now Jews, and the street names Hebrew. The buildings are low-rise apartments, built in stone, as is the entire city. Some of the buildings are new and others were large houses, now converted into apartments, with some stories added, stone over stone, as in the oldest parts of the city. The neighborhood looks homogeneous and relatively affluent, with here and there interesting shops and small restaurants, an arts cooperative and organic food restaurant in a former leprosy asylum, a wine store with only Israeli wines, a small café with three tables and breads and pastries, a tired supermarket, lacking a bar of soap, but with salt from the Dead Sea. My cousins’ aunt owns a long and rectangular ground floor apartment, one room deep, in an old Ottoman house. 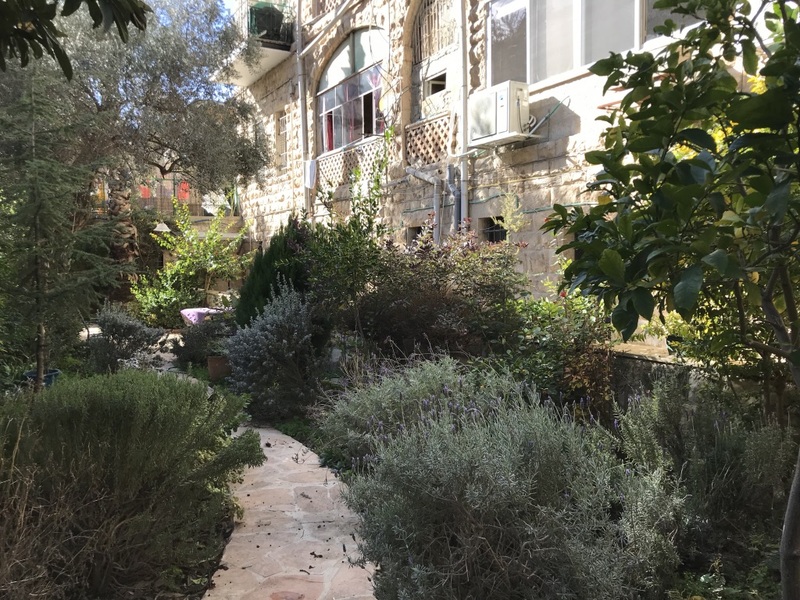 The entry is through a gate and a long fenced-in garden, at the rear, with a stone terrace, a lemon tree, a garden shed, path and flowering shrubs. It was raining when I arrived, and inside, stone walls, a tiled floor, and eclectic fenestration and doors face the greenery. The aunt, Yocheved, a Zionist now in her 90’s, fought in the 1948 war, lived here for some years, worked for the Anti- Defamation League in New York and has lived, primarily, at 100th Street and Riverside Drive, for years, just eight blocks south of me. Her husband was a prominent biblical scholar, and they spent the summers here. I know her as Judy, who can command a Seder and read complex Hebrew text at the morning service of the Ansche Chesed synagogue on West End Avenue at 100th Street. She is a huge personality and she and her friends, American women, know the texts as they know Judaism. Berhanu’s tour of the old city began outside the walls, which date from Herodian times and were built up by the Ottomans. Our first stop was on Mount Zion, which surprised me, but it was the site of either King David’s first castle or alternatively where he first, temporarily, placed the tablets and the arc of the covenant. The main church is German Catholic, built over much earlier ruins. 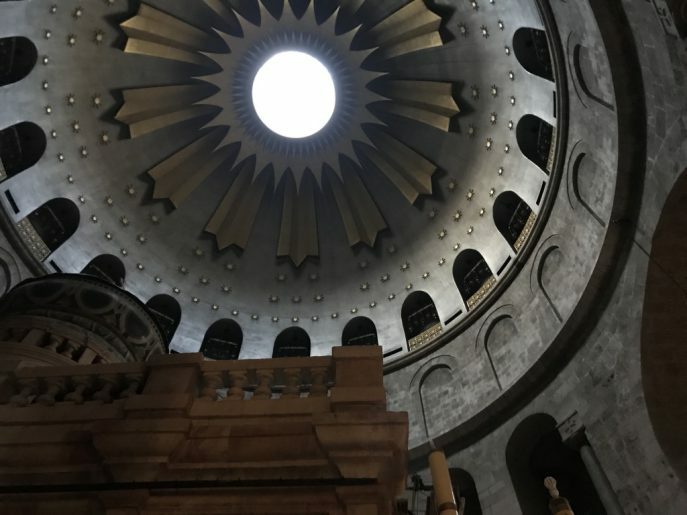 The Christians first focused on this site because of its earlier importance, and because Mary, the mother of Jesus, was linked to earlier Hebrew symbols. Architecturally, the building resembles Greek Orthodox churches and Greek Orthodox art, which, more than the Roman, inherited the earlier Hebrew aversion to statuary and three-dimensional representation. 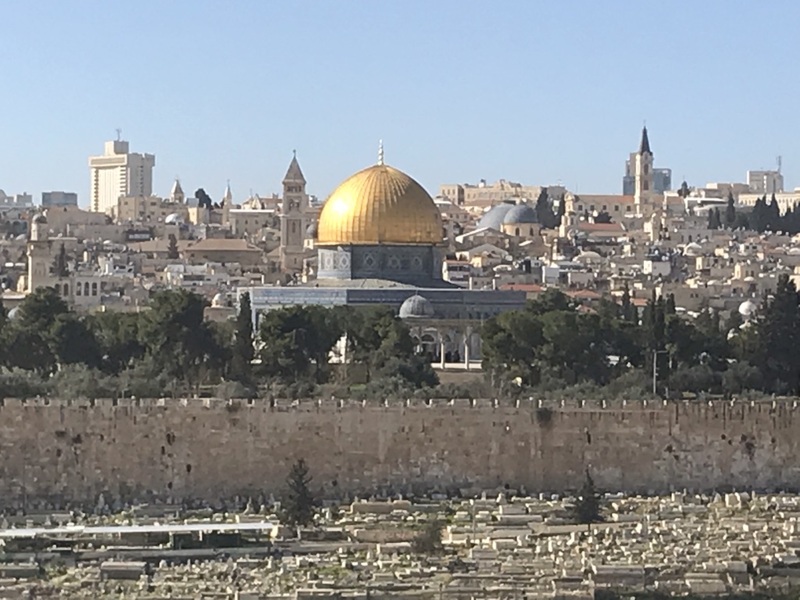 Except at limited hours, the Temple Mount is not readily accessible to non-Moslems, a disappointment, as I had read that it is extremely beautiful. 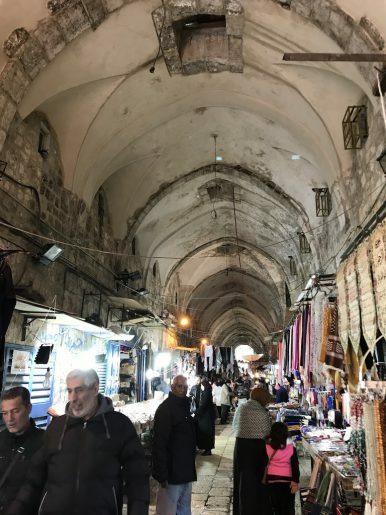 The Turkish market, a long vaulted street, lined with shops and stalls and crowds, leads directly to a main entrance to the Mount. But access is now guarded by Israeli soldiers, who guarantee its security and would allow me no further. The Jordanians rule from within. 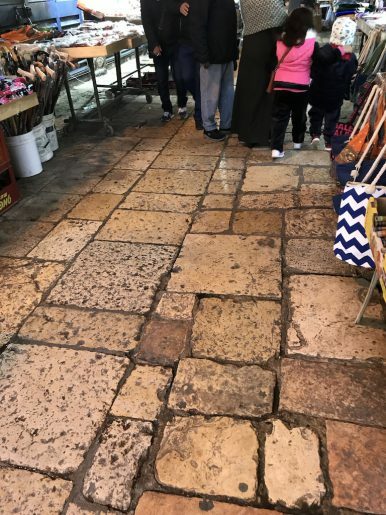 Walking the streets of the Old City is an intense and ancient experience. The city feels older and more complex than anything I have seen in Europe—something like the ancient complexity of Rome, an imperfect comparison. 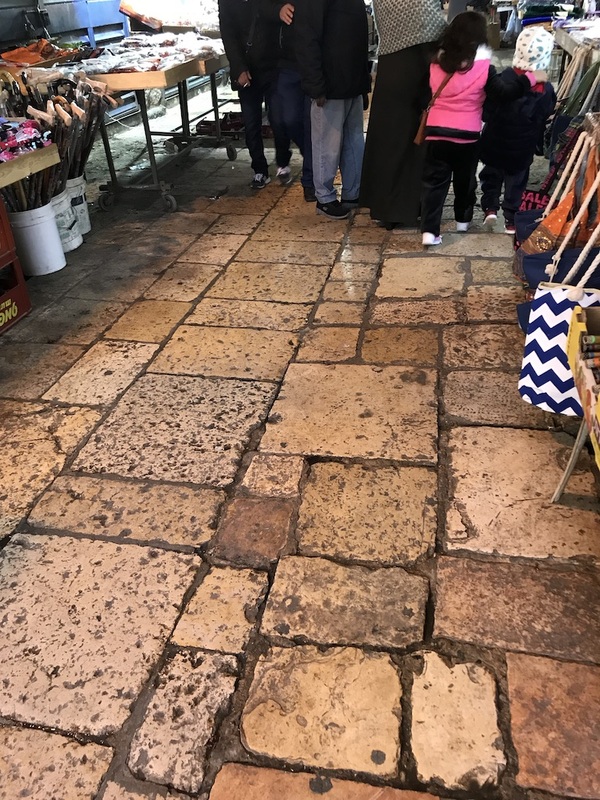 The streets of the Moslem section are crowded with shops and people, a warren of narrow, often covered, pedestrian streets shared by Moslem and Jewish visitors. This is the Middle East, and the city is also a crowded bazaar, with cheap clothing, houseware, and hardware stores, spice shops and food markets, and in the less crowded Christian section, store after store of religious objects and art. People live here in tight conditions, even in this relatively quiet post-Christmas season. Hostility is unpredictable and there is no easy escape. 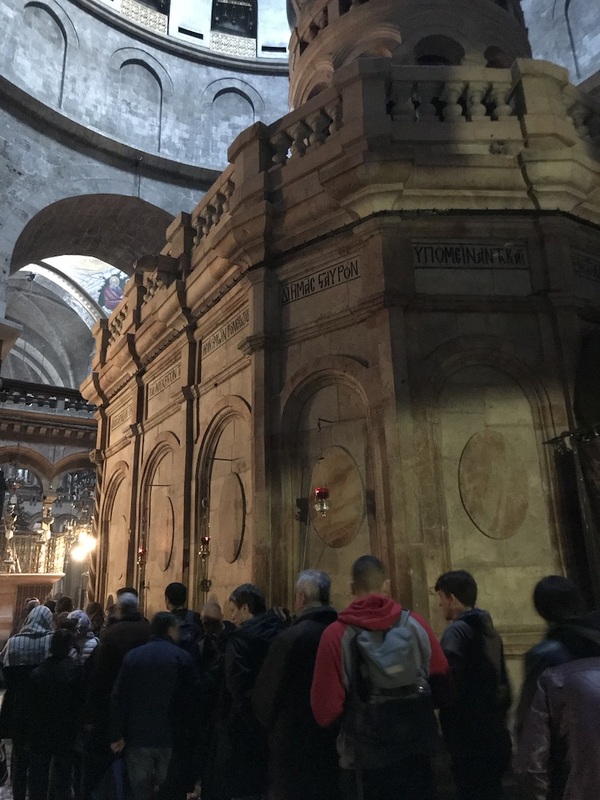 The Church of the Holy Sepulchre is where the mother of the first Christian emperor, Constantine, found the true cross and the burial tomb of Jesus. We enter from crowded streets through small chapels controlled by Ethiopian (and therefore African) orthodox clergy. They sing and worship in an ancient semitic language, and the two chapels each reproduces the ancient Temple’s Holy of Holies, a small room with an Ark of the Covenant and tablets within. The Ethiopian Orthodox Church is said to date from 43 AD, belying the ancient presumptions of Christian Europe. The main church is shared by the Greek Orthodox and Catholic, and to a lesser degree Armenian, churches, all struggling for relative control and the primacy or legitimacy of their various theological interpretations. The church is gorgeous and ancient and strangely intimate, with a long line of pilgrims waiting to enter Christ’s Byzantine tomb, all standing beneath the dome of its grand Crusader chapel. This is a city that is a living place, much more than a series of churches and museums. It has been worshipped and fought over, but it is the latter, the struggles for power, identity and theological interpretation, that I am feeling everywhere. The struggle is very ancient, so much older than we commonly reference, of religions and sects fighting for legitimacy, as defined by control, or asserting control or re-asserting control of holy and previously holy places. I am fascinated to see it but recoil from associating with it. Let’s give these ancient sites to those who define their beliefs by control of them. I see nothing in it but pain and grief. Judaism survived and evolved for two thousand years without Jerusalem, although Judaism brings me here again as I seek to redefine my relationship with it. I need Israel, but perhaps I do not need ownership of this old city or control of it. I want to honor it, but I do not want to repeat the past and fight over it, even if others would inevitably and again, deny me access to it. In my view, and perhaps that of others, we created what underlies it and can be proud and honored by what arose from it. We no longer need to control it to define us. “We no longer need to control it to define us.” =A profound and essential statement.